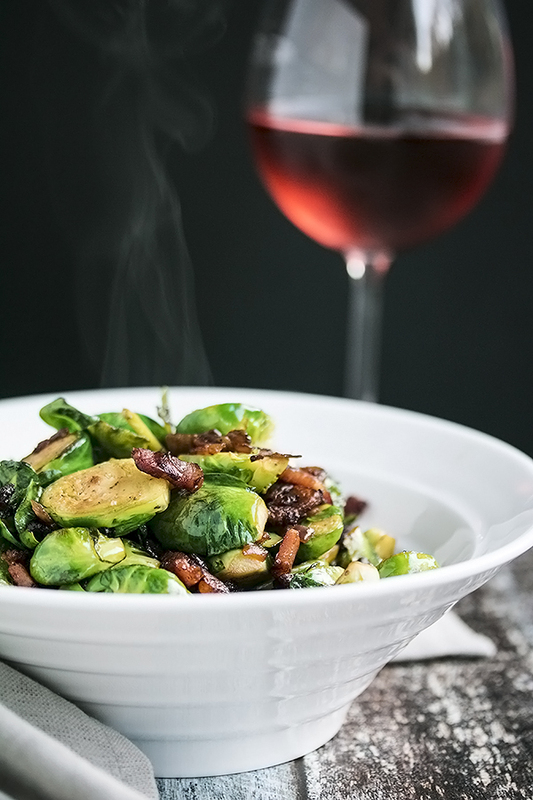 These pan fried brussel sprouts with bacon are the perfect side dish for any occasion! 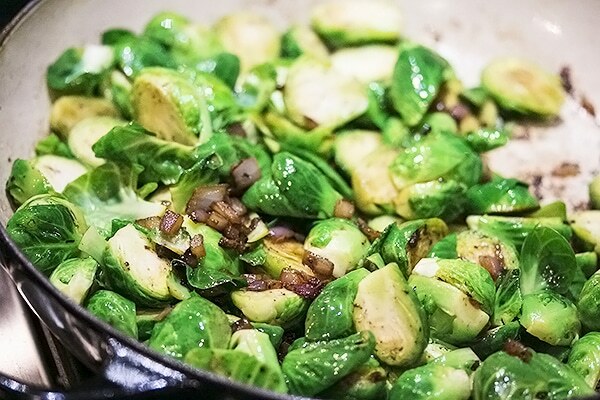 The sprouts are caramelized with bacon and red onion with crispy bits on the edges. Then if you want them a little more fancy, toss them with crunchy candied pumpkin seeds and serve with an easy pomegranate gastrique. Mark is the only one in our family who likes brussel sprouts. Or I should say he was…. until now. In the past we have always had brussel sprouts on the table at thanksgiving or Christmas and its kind of a tradition that each of us (except Mark) has a single token piece as they are passed around, just so we feel like we’re eating one. This year things are different. Even the biggest brussel sprouts haters among us took a second helping of these pan fried brussel sprouts with bacon. Shocking, I know… but true. No longer will your family turn up their nose at these poor little spouts. They might even ask you to make them for just a regular old sunday night dinner. Wash these little green gems well and peel off the first layer or each and then slice them in half. In half is best because they stay together (mostly), but it creates a flat edge that can get all browned and delicious in the pan. Next, get the sliced bacon cooked, fat rendered and nice and crispy. Remove the bacon from the pan after its crispy. 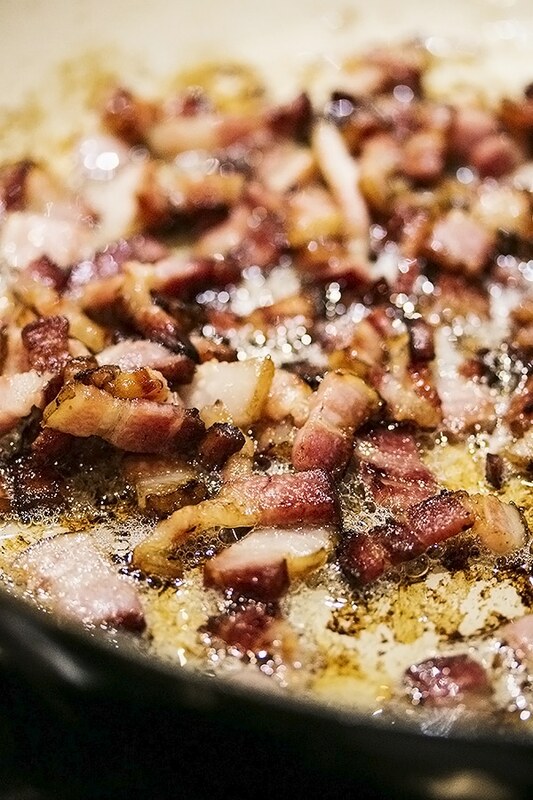 Leave a few tablespoons of the bacon fat in the pan and turn the heat to med or med – high. Add the onions and brussel sprouts. Cook them but don’t stir too much. You want the flat edges to get browned. It doesn’t take very long for them to get nice and caramelized on the edges. Beautiful! 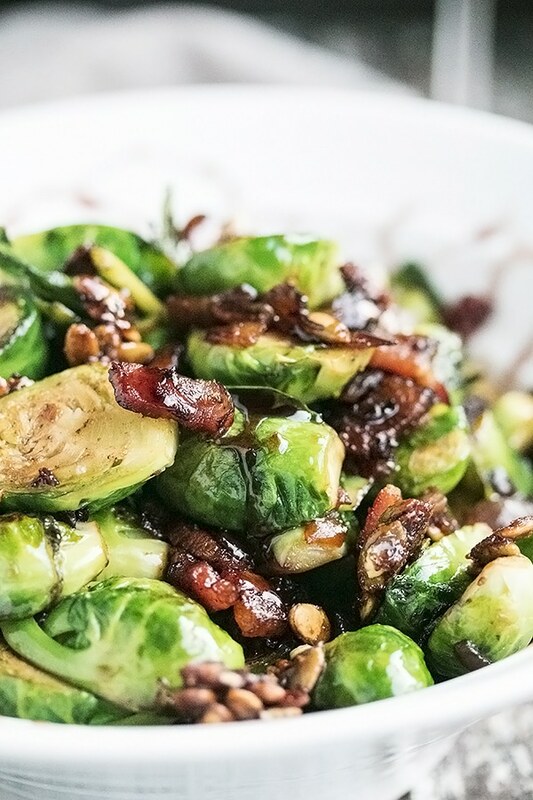 A gastrique is just a fancy name for sauce that is made with vinegar so it has a sweet and tangy taste to it that goes so great with these pan fried brussel sprouts with bacon. How long does it take to make pan fried brussel sprouts? The brussel sprouts themselves only take a few mins to cook. You want them to be soft, but still have some bite to them and definitely not be mushy. 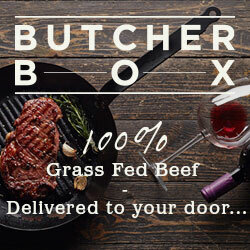 I often make this dish to go along with a steak after work because its so quick to make. But if I make it on the weekdays, I don’t add the candied pumpkin seeds or gastrique and they are still really really good. Enameled Cast Iron Braiser – I love my enameled cast iron so much! Especially this big pan to cook everything awesome. Worth every penny! Regular Cast Iron Pan– a little bit cheaper, and still a great choice for cooking dishes like this! 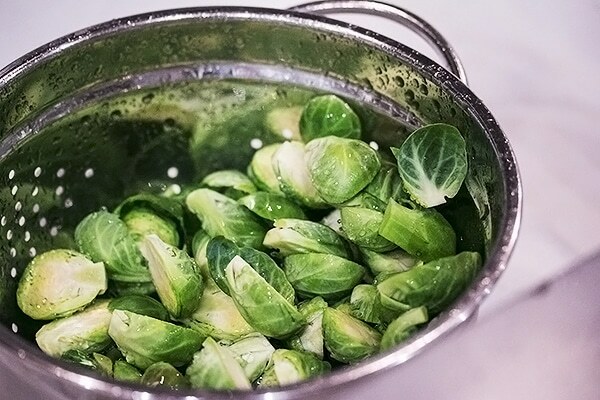 Stainless Steel Pan – another great option for getting nice color on your brussel sprouts, or anything else for that matter. 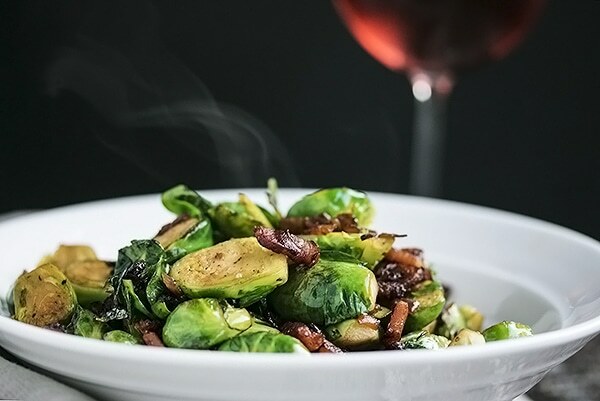 If you’ve tried this pan fried brussel sprouts with bacon recipe then don’t forget to rate the recipe and let us know how it turned out in the comments below. We love hearing from you! 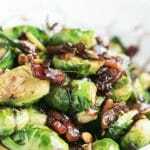 Pan fried brussel sprouts are caramelized with bacon and red onion with crispy bits on the edges then tossed with crunchy candied pumpkin seeds and served with an easy pomegranate gastrique. Cook the water and sugar till sugar dissolves, add the vinegar, then add the juice and simmer till it decides and thickens so the mixture coats the spoon. Heat a frying pan to medium heat. add the pumpkin seeds and toast them in the pan for a min or so and then slide them onto a plate. Add the sugar, cinnamon, cardamom, chipotle powder and water to the pan. Cook until the sugar dissolves and the mixture gets all bubbly. Throw in the pumpkin seeds and cook for another three mins. Pour onto parchment paper to cool and then break them apart and set aside. Heat a large frying pan to medium-low heat. Add the chopped bacon and cook till the fat renders and the bacon starts to get nice and crispy. You might need to turn up the heat to medium. This will take at least 5 mins. Scoop the bacon out and place on paper towel to wait. Make sure you have about 2 or 3 tablespoons of bacon fat left in the pan. You can get rid of the rest. On medium heat, add the onions to the pan and saute for a min or so. Add the brussel sprouts and saute till they get cooked through and nice and browned on some parts. You may have to turn up the heat a tiny bit to get some nice color. Add the bacon and give it a quick stir. Season the dish with salt and pepper at this point. Then pour into a serving dish. Sprinkle with a generous amount of the candied pumpkin seeds. Serve with the pomegranate gastrique. You can either drizzle the sprouts with the pomegranate gastrique or just serve on the side so people can help themselves. Or if you are nicely plating your dinner, place a dollop on the plate and smear it along the plate with the back of a spoon then place the brussel sprouts on top but so you can still see the gastrique. Either way, its delicious!